?Atmos? Jaeger-LeCoultre, "Atmos", No. 92531. Made in the 1960s. 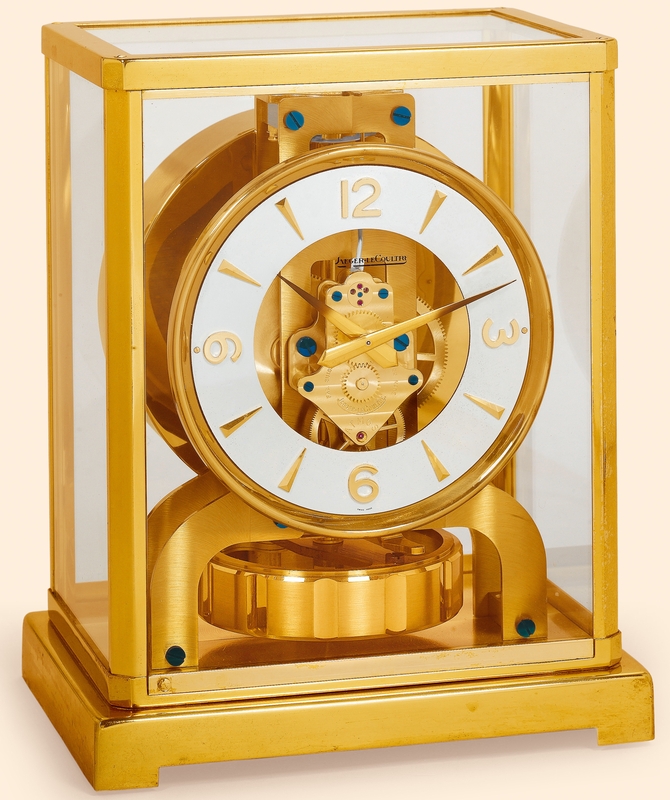 Fine, rectangular, gilt brass and glass Atmos clock wound by changes in the temperature. C. Glazed on 4 sides and on the top, stepped plinth base. D. Applied gilt faceted dart indexes and Arabic quarter-hour numerals on a silvered annular chapter ring. Gilt Dauphine hands. Atmos The Atmos clock was invented by Neuchâtel engineer Jean-Léon Reutter (1899-1971). From his youth, he was preoccupied by the idea of industrially producing a clock that could be wound by atmospheric fluctuations, and in 1928 he succeeded. Reutter?s patent was first licensed to a French company who exploited it until 1935. Subsequently, it was purchased by Jaeger LeCoultre. After difficult early years, by 1979 there were half a million such clocks which quickly became popular and prestigious gifts for the important heads of states during their visits to Switzerland.